Discussion in 'Headphones (full-size)' started by jude, Dec 20, 2017.
trellus, VRacer-111 and frogmeat69 like this. Wait a minute. Does the production model have the HD 650 style headband padding? Looks like it, assuming that above review sample is not a special case. trellus and Assimilator702 like this. Following are my measurements of the production Massdrop x Sennheiser HD58X Jubilee. I'll post some subjective impressions later that will be a longer version of saying, "I really like it, and it's a big improvement over the prototype." Mshenay, Mark Up, rendyG and 11 others like this. It's a darn sticker, worth nothing. I'd rather have higher number - at least those wouldn't be test runs (not that I don't trust Sennheiser's QA). Don't be so trusting of big companies, Sennheiser themselves screwed me before and some of the people from their service departments are deaf apparently. What is the SN of the unit you tested? I'm curious if there are differences between their low and higher SNs. ...What is the SN of the unit you tested? I'm curious if there are differences between their low and higher SNs. Sorry, I should have put that right in the measurements. It's 005201. I'll get the HD650 serial number tomorrow. I noticed that all the measurements are at 90 dBSPL, I assume it’s some kind of standard, in your experience is there a significant difference at different volumes? I'm sure many people will be pleased if Sennheiser decided to change to the HD650 style headband pad. The twin HD650 style is more aesthetically pleasing. Something about the 4 pil style just bugs me. I was planning on changing mine out so that saves me $20 and a bit of headache. So Jude, care to share your impressions on the jubilee sound signature likes, dislikes? Thoughts on its sound versus its siblings? The Hd600, HD650, and HD660s thx in advance. My updated thoughts on the finalized version of the HD58X Jubilee are fairly simple. First off, my original post from the prototype version are here. I would say that much of that post remains accurate. These are still an absolutely phenomenal deal at their price, and are just the sort of thing I like to see in this era of $2,400 Sennheiser flagships. The most obvious difference, from a purely physical perspective, is the switch from HD600 style head pad (the "4 lumps") to the HD650 style head pad (the single long pad with a split in the middle). For me the difference is inconsequential. Having said that, I rarely hear of anyone who actually prefers the newer style.... people tend to like the lumps or else they don't care. 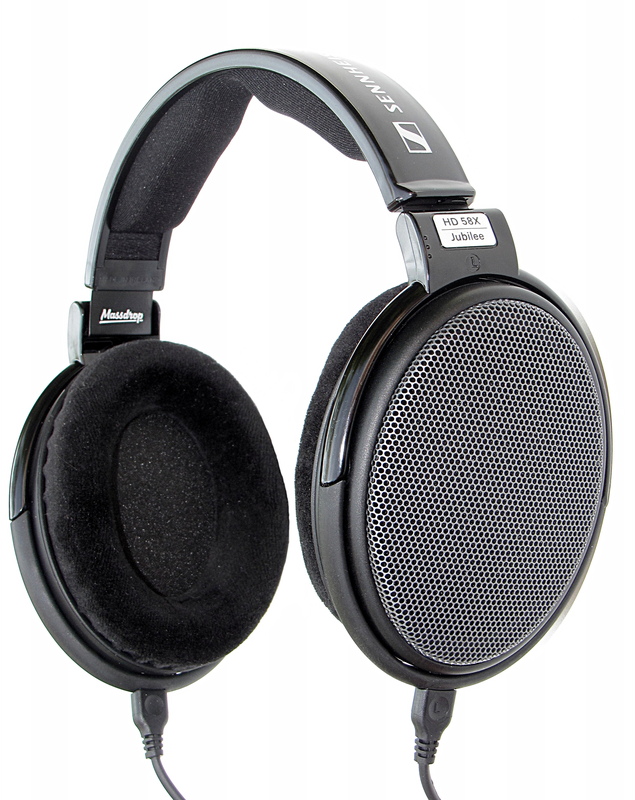 So with that in mind I wish the finalized HD58X stuck with the original lumps. I could be way off bass on this though. From a sonic standpoint, the newer tuning does have a more authoritative bass kick. It stands out right away when compared to the prototype, and is still fairly obvious compared to an HD650 or HD6XX. I maintain that the prototype HD58X I had seemed a little more bass heavy than what others were experiencing from their examples. In any case, even the prototype I spent time with was still a bit less warm than what many expect from this series. The finalized version takes thing up a notch to where I don't think anyone would call it bass light. No, this is still not a bass cannon. If you want a Fostex TH-X00 type of bass impact, you won't get that here. What you do get is possibly my favorite take on the Sennheiser 6-series low end. It sounds "meatier", more impactful, but not at all bloated. The boost is all down low, as you can see on Jude's measurements. Very tastefully done. Next comes the more refined upper mids and treble, which again is very welcome. I liked the prototype but I love the final production model. This is among the smoothest response I've heard from any of the HD6 series. Upper mids and highs are just so well controlled and clean, without losing much detail or feeling overly dark. There's still an awful lot of air up there beyond 8kHz. In fact, there's more now than even a stock HD650. So while upper mids are more relaxed, certain things - snare drum snap, for instance - can actually feel more energetic. The final result is a very well balanced headphone which remains (relatively) easy to drive, and plays well with poor recordings and questionable sources. I suppose if someone preferred the HD600, they might find the final HD58X a bit too smooth, but that person really should be purchasing an HD600 in the first place. For lovers of the HD650, I see no major downsides here. It's been a while since I had an HD660S here to play with, and I didn't have enough time with them to really lock in a solid opinion. But from limited memory, I don't think there's anything compelling going on there over this HD58X Jubilee. In fact I seem to recall a slight unevenness in the treble that I'm not hearing with this HD58X. I could very well be remembering it wrong though. I would very much like to see Jude's measurements on those models compared directly. Bottom line, for me, the $150 HD58X is arguably one of the best entries in Sennheiser's HD6-series, and the absurd price advantage it carries over all other models makes it an easy recommendation. As much as I enjoy the HD6XX for $199, the HD58X makes even more sense in most cases. Forgo the fancy "storage" box (which most of us won't use anyway), get improved low end response, smoother upper mids and treble, more air up top - all for less money. The only caveat - users of really high-end systems will get more out of the 300 ohm models, where the new 150 ohm drivers don't seem to scale so high. For everyone else, the HD58X makes perfect sense. Mark Up, rendyG, FlySweep and 8 others like this. Thank you for your impression appreciate them. I was done with full size cans but the price for a sennheiser HD series can was to compelling so I bit. Mine shipped today and I will be using them with my SP1000 DAP. Very much looking forward to enjoying them for years to come. Ditto..good stuff. Got my shipping email today... can't wait!! I just backed out of the current HD6XX drop based on your assessment. Plan to pick up a HD58X when it drops again. From what you describe, I think I would like it better than the HD6XX. It should also work better with my gear which isn't high end Thanks! Don’t know why mine have been sitting in NJ when I got a “shipping label created” email on Friday. Massdrop is soooo sloooooow. My HD58x just shipped, they used FedEx this time instead of DHL. Should arrive this week instead of ten days from now, so glad to see Massdrop changed their shipping method. lol I have had a rough week and half with medical stuff, really going to enjoy getting these in the mail and relaxing. Probably will buy some Dekoni pads for them at next drop.